Today there is big drama in Buffalo because it is our mayoral primaries. We have the choice of two Democrats, Byron Brown and Mickey Kearns. 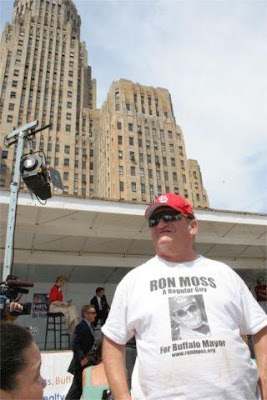 Remember when Howard's cousin Ron Moss ran for mayor? That is his picture up above on the day of the great mayoral debates of Aug. 11, 2005. How time flies. I had long hair then! 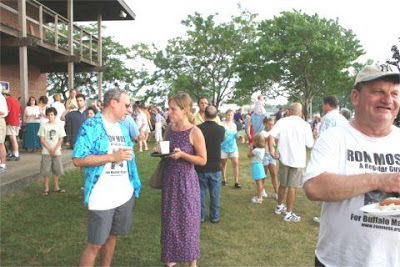 That is me in the blue dress with the long hair in the middle of this picture of a Ron Moss fund raiser at the West Side Rowing Club. The candidate himself is visible on the right. The current race does not have Moss in it. He was considering a run but he was too busy. But it is an engrossing race nonetheless. There is one thing I like about Kearns. It is that he would like to have cops walking the beat. You would have one cop every couple of blocks and that cop would get to know the people in the area and crime would go down there would be fewer boom cars. I put in the part about the boom cars. I figure there would be that result. I love that idea about the cops. I would love to see that happen. 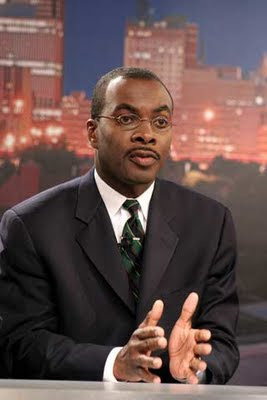 But that cop business is a small matter next to an overriding concern: Byron Brown is my buddy! ...all the time on this Web log. Byron Brown calls me "Mrs. Goldman" which cracks me up. No one else calls me that! So I like that about Byron Brown, that he knows who I am. Also remember when he sent that birthday card to my friend Jane? I like that about him too. For all those reasons I am a Byron Brown girl. I support him. That is the way things go here in Buffalo. That is how we do things! It was that way when Leonard Pennario lived here and it is that way now. Besides, the business about the cops walking the beat, no matter who wins, it will never happen. It makes too much sense. There must be some reason it has not been done yet. The police union or the American Civil Liberties Union or some union must be against it. I am sure Byron Brown would do something like that if he could. Well, this contest is not up to me! In Buffalo if you are a Republican you get no vote. It feels funny. Yesterday I was at Kensington and Bailey and Byron Brown's guys were all out on the corner, shouting "Byron Brown!" and handing out flyers to drivers stopped at the light. There I was sitting there with my windows down and you know what? No one approached me or handed me anything. They must have known I was a Republican! Still it is great to see all the excitement. I do not know when I last saw anything like that, people out on a corner yelling for a candidate. I liked that. I will enjoy seeing how this turns out. You drive a Republican car, is why they gave you a wide berth. Ward, did you see that letter to The Buffalo News a while ago -- this woman wrote in objecting to Cash for Clunkers and she referred to her Crown Vic as "Vicky." I thought that was hilarious. Yes, Vicky gets a wide berth!